The average of the latest EU referendum opinion polls put the LEAVE and ReMAIN camps virtually neck and neck on 44% with 12% undecided, which compares against a month ago of 42% LEAVE and 48% REMAIN, 10% undecided. So it is no wonder that the REMAIN camp has gone into panic mode with a relentless torrent of fear mongering emanating from the establishment REMAIN camp. The narrowing of the polls is even more remarkable given that Brexiters are financially outgunned by at least 10 to 1 as the government has been calling on a litany of state funded favours from the likes of President Obama, Bank of England Governor Mark Carney, IMF Chief Lagaard and even ex Prime Ministers such as Gordon Brown and John Major all of whom have been busy this week reading from the establishments fear script in an attempt to frighten the British people into PERMANENTLTY giving up ANY chance of attaining FREEDOM from the emerging anti-democratic European Superstate. Therefore, with just over 5 weeks to go then NOW is the time for BrExiters to go for broke in a last ditched sustained effort to convince as many voters as possible to vote for FREEDOM on June 23rd, for all sides agree that there won't be another referendum, therefore this is it, it is now or never! 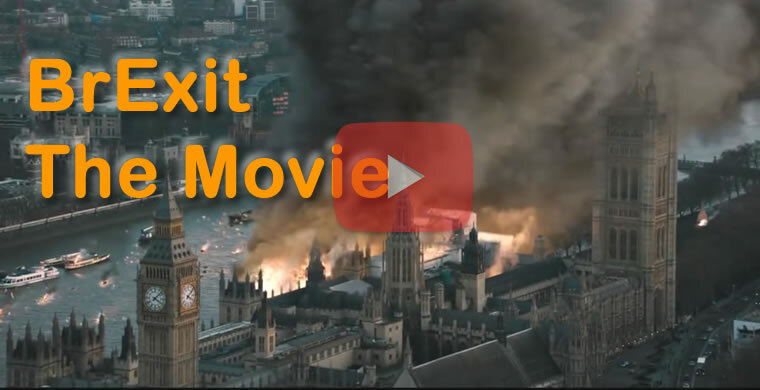 Furthermore you too can now support our campaign for BrExit Freedom, allowing us to further intensify our in-depth analysis and forecasts of the consequences of failing to vote LEAVE, rebuttals of the Remain campaign's daily propaganda and produce entertaining video's to help convince the undecided that a vote for Brexit would herald a New Dawn, New Life for Britain. 13 May 2016 - UK Immigration Crisis - Official Statistics Underreport Real EU Migration by 50%! The mainstream press is belatedly waking up to the fact that the UK governments official migration statistics compiled by the ONS under report real permanent immigration from the EU by at least 50% per year! For instance ONS EU immigration stats since 2011 was a net 1 million european union migrants permanently settled in the UK. However during this same time period 2.2 million National Insurance numbers were issued to european migrants. I have been flagging this huge persistent disparity in numbers for several years now that illustrates that the official immigration statistics just cannot be trusted! The mostly funded by EU member states OECD's Pro-Remain report appears to have badly backfired is its analysis concludes that if the people of Britain voted for BrExit then that would result in 1.2 million FEWER migrants into Britain as average net migration into Britain would fall by 84k per annum and also slow house price inflation. So apparently according to a blundering OECD the people of Britain should vote to REMAIN so that Britain can be flooded by 1.2 million EXTRA migrants (+4.6 million total)! Operation Fear, (REMAIN Camp) keeps ratcheting up the threat of what awaits Britain should the people choose to vote for freedom on June 23rd. The most recent warnings of which were literally that BrExit trigger a world war, a nuclear apocalypse. Which is completely ignorant of the fact that it is NATO and not the EU which has kept the peace for over 70 years, including defeated the Soviet Union, NATO not the EU! Whilst FEAR also appears to be the primary message out of the LEAVE camp, Fear of out of control immigration, fear of EU bailouts forever, which whilst being far closer to the truth than the REMAIN camps fear mongering, nevertheless the messages of FEAR are all prevailing, frightening and turning people off. 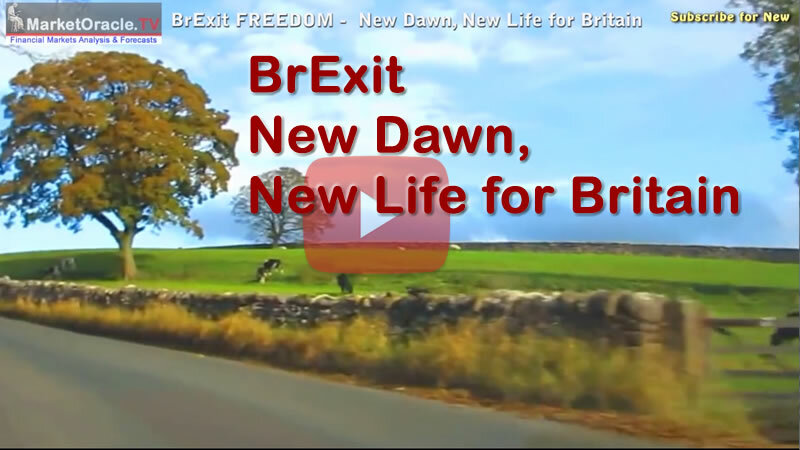 So instead I offer my latest video as a message of HOPE (mostly), a message of a New Dawn, New Life for Britain, summed up in one word FREEDOM! 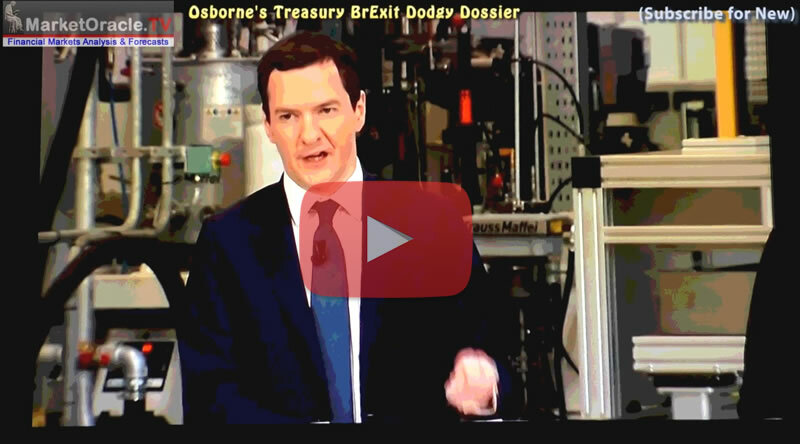 Chancellor George Osborne led the charge of the light brigade by publishing a UK Government (Treasury) report that concludes that leaving the EU would cost the UK potential future GDP growth of 6.2% (Canada model) per annum by 2030 in relative terms i.e. that if BrExit happened annual GDP whilst still growing would be 6.2% lower by 2030 than if Britain had Remained within the EU. 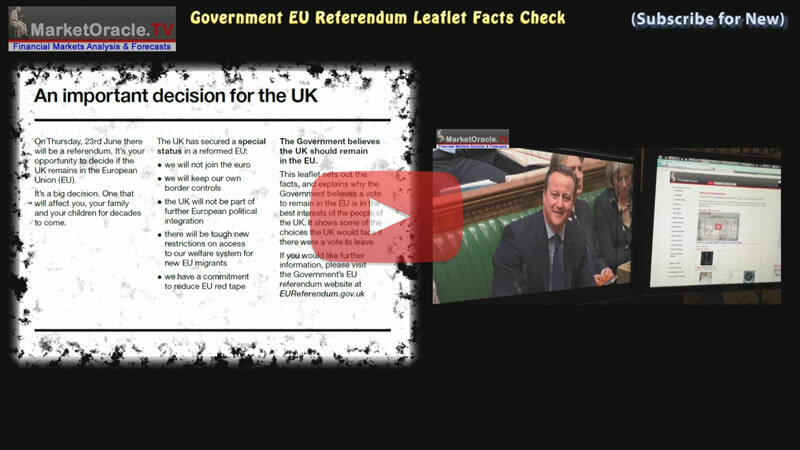 The Conservative government over the next few weeks will send out a propaganda leaflet to 27 million households at a cost to British tax payers of over £9 million in an attempt to convince the electorate to vote to remain in the European Union that this video attempts to facts check whether the claims stand up to close scrutiny or not. 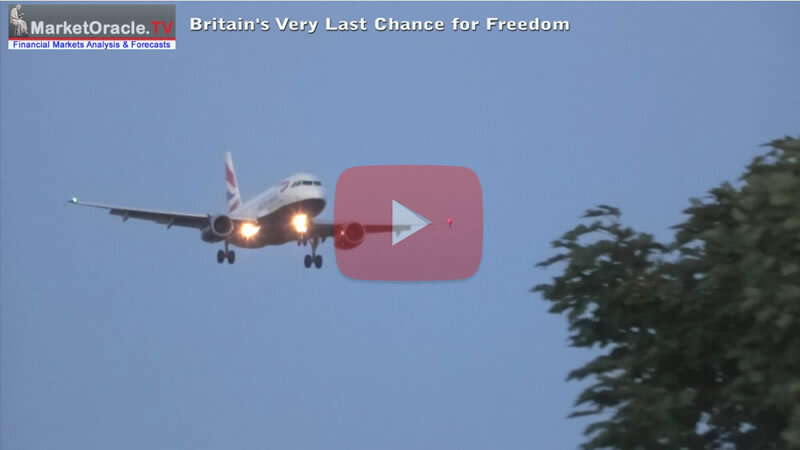 Can Britain Break FREE of European Superstate? Prime Minister David Cameron has defacto surrendered virtually every point of his already heavily watered down non binding proposed deal with the European Union who stated would only legislate the laws AFTER the the UK had voted to remain within the EU. Which the EU Parliament President clarified as implying that virtually every aspect of the deal would be subject to debate and resistance from the dozen or so eastern european benefits claiming states, who would likely decide to reject most of the so called UK deal, that would effectively have been used as a smoke screen to hoodwink the British people into giving up their democracy and freedoms. Britain's Prime Minister, David Cameron emerged on Tuesday waving a piece of paper 'Chamberlain' style of a 'draft' deal that follows several months of negotiations that had the PM running around Europe begging the likes of Donald Tusk (former Polish Prime Minister) and former eastern block nations for some return of sovereignty to Britain. A piece of paper that whilst heavy on number of pages but is light on substance of anything that comes even close to matching the Conservative Manifesto pledges of a series of supposed red lines ahead of Britain's EU In / Out referendum.